Browse: Home » 2011 » January » Coasters! I’m making hand-crafted coasters with glass tiles and felt bottoms. The printing method is a transfer that’s coated with two layers of acrylic. I’ve been using some prototypes as real, live coasters for a couple of months now, and they’re handling all my sweaty drinks with ease. Each of these coasters will be unique, as the transfer process isn’t all that consistent, and the main material for the coaster may be stone, ceramic, or glass tiles, depending on what I get my hands on. 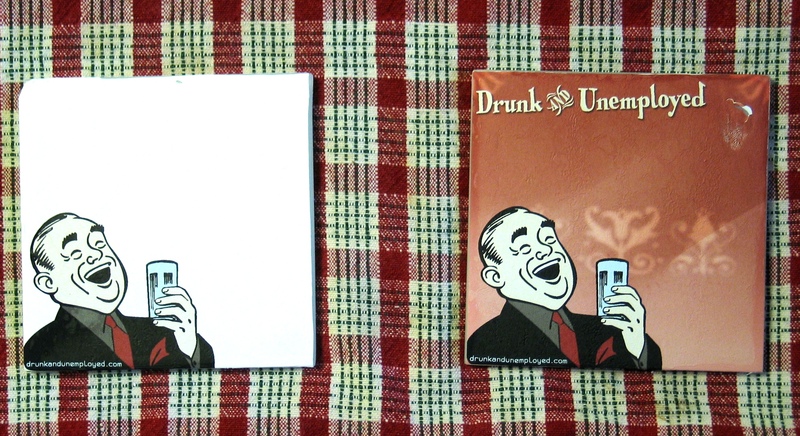 A 4-pack coaster set will have all the same tiles, so they’ll be a proper set. Ordering is currently through Google Checkout. The white coasters can be customized with any phrase. I’ll contact you after purchase to confirm what you want on the coaster. The phrase will be hand-written (via graphic tablet) and printed on the transfer and will be sealed with the acrylic coating. These coasters are going to be printed on demand, and sent out within 3 days of your order. Shipping is standard US Postal Service, which takes anywhere up to a week. If you’re in a hurry, or out of the country, shipping will cost more than the rates listed. If you’re not satisfied with your order, return it, and you’ll get a full refund.